Enjoy GLTC’s safe, affordable, and dependable transportation while keeping the environment clean. GLTC operates 14 bus routes within the City of Lynchburg and a portion of Madison Heights, Monday through Friday, from 5:00 a.m. to 10:15 p.m., and 10 routes on Saturday between 6:00 a.m. and 10:15 p.m.
NO service is operated on New Year’s Day, Easter Sunday, Memorial Day, Independence Day, Labor Day, Thanksgiving Day and Christmas Day. 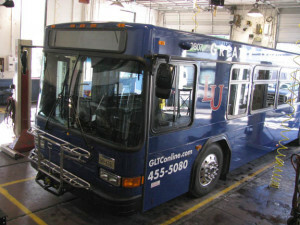 The main transfer point for the GLTC fleet is the transfer station located at 800 Kemper Street. Buses arrive at the transfer center every half-hour at quarter past the hour (:15) and quarter ’til the hour (:45). All routes (except Routes 6 and 7) begin and end at 800 Kemper Street, where passengers may make their transfers to continue on with their ride. A route number and written destination identify all buses. Bus stops are marked with a sign bearing the GLTC logo and route number. Transfers to/from Routes 6 and 7 occur at River Ridge Mall. Also, for your convenience, transfers between different routes can be made at River Ridge Mall and Whitehall Road (behind Fresh Market). If you notice ANY suspicious activity or see an unattended package, please notify the bus operator immediately.